Mining groups are reporting that the BLM will increase annual maintenance fees on association placer mining claims on public lands 8-fold, from $140 to $1120 per 160 acre claim. Lode claims are not on the table in the correspondence I've seen. The Northwest Mining Association reports that "effective with the claim maintenance fees due September 1, each 20 acre placer claim will require a separate claim fee. 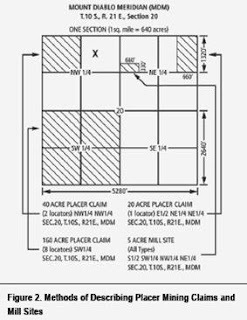 Association placer claims will require a claim fee for each 20 acres or fraction thereof. Thus, a 160 acre placer claim will require 8 claim fee payments instead of one.” The fee was previously raised to $140 from $100. New claims also require a $15 filing fee and $34 location fee. The latest numbers I can find show 43,924 mining claims in Arizona as of 2008. I don't know how many are association placer claims. [Right, mining claim delineation. Credit, BLM] The new fees would increase total annual maintenance fees in Arizona from $6.1 million to $49.2 million on that number of claims. Update 5-1-12 9:30 pm: Thanks to the anonymous commenter below who pointed out my error in initially saying all mining claims would be affected. In fact, only association placer claims are discussed by the BLM responses. That makes my last statement (crossed out) incorrect. CFR § 3832.22 How much land may I include in my mining claim? (a) Lode claims. Lode claims must not exceed 1,500 by 600 feet. If there is a vein, lode, or ledge, each lode claim is limited to a maximum of 1,500 feet along the course of the vein, lode, or ledge and a maximum of 300 feet in width on each side of the middle of the vein, lode, or ledge. (b) Placer claims. (1) An individual placer claim may not exceed 20 acres in size. (2) An association placer claim may not exceed 160 acres. Within the association, each person or business entity may locate up to 20 acres. To obtain the full 160 acres, the association must consist of at least eight co-locators. You may locate smaller association claims. 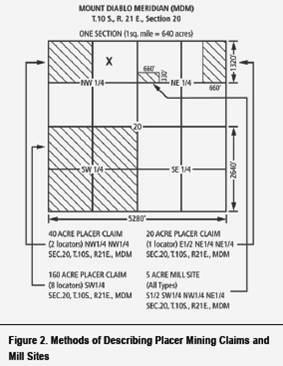 Thus, three co-locators may jointly locate an association placer claim no larger than 60 acres. You may not use the names of other persons as dummy locators (fictitious locators) to locate an association placer claim for your own benefit. 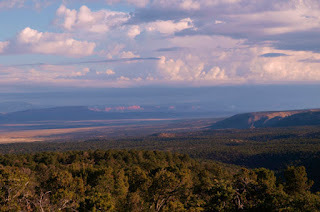 The St. George (Utah) News starts off with the statement, "For well over a century the complicated and often uneasy relationships between conservationists, miners, ranchers, and the U.S. Forest service over the Grand Canyon watershed continue." The writer proceeds to offer insights from each of those constituencies, in a non-pejorative manner. Is multiple use no longer feasible if the natural qualities of the region are to be preserved? -- Are those natural qualities special enough to justify federal protected status? -- Do all 1.7 million acres need to be protected in what amounts to a nearly unbroken landscape 100 miles wide and 100 miles deep? -- Can the conservation strategies employed by current land managers be made more responsive to concerns raised by monument proponents -- without the need to create a monument? 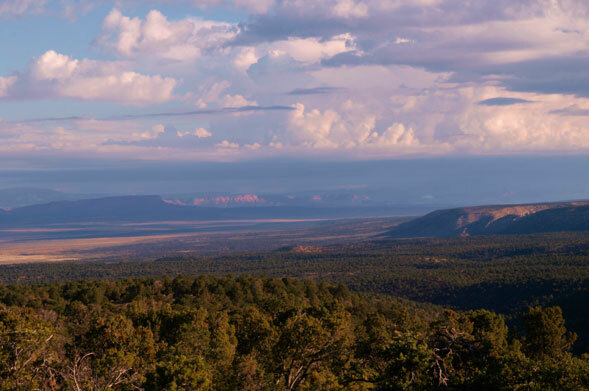 They conclude, "A new national monument extending all the way to the Utah border should have outstanding natural qualities that override traditional multiple uses." 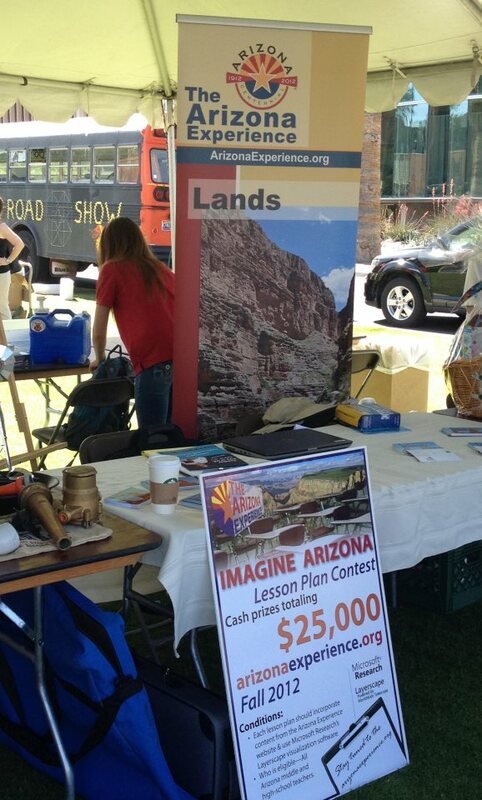 AZGS had a booth at yesterday's Teacher Day at University of Arizona, that was organized by Tucson Values Teachers. We showcased the Arizona Experience interactive website and announced the "Imagine Arizona" contest aimed at encouraging teachers to use the varied content and software apps on the site in lesson plans. There are prizes totaling $25,000 to be awarded next Fall for winning entries. Microsoft Research is a major sponsor of the contest, along with the Helios Education Foundation. 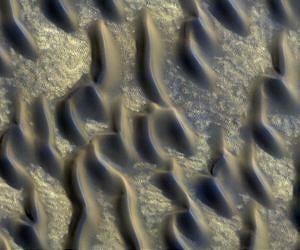 An article in the journal Geology by two ASU planetary scientists describes discovery of glass-rich sand dunes across as much as one/third of Mars that have implications for water and thus life on the Red Planet. The article concludes "Our results provide potential confirmation of models suggesting that explosive volcanism has been widespread on Mars, and also raise the possibilities that glass-rich volcaniclastics are a major source of eolian sand on Mars and that widespread surficial aqueous alteration has occurred under Amazonian climatic conditions." The American Bird Conservancy is warning that the old PVC mining claim markers are luring millions of birds to their deaths across the western U.S. and has launched efforts with federal and state agencies across the region to remove the pipes from public lands. Arizona's state bird, the cactus wren, is identified as one of the species affected. 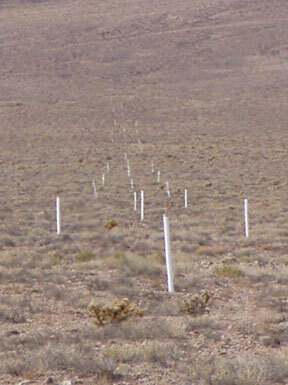 Surveys in Nevada and Oregon found an average of one or two dead birds per pipe stake, with highs in the low 30's. ABC said, "A 1993 Nevada law prohibits installation of new uncapped or uncrimped pipes for marking the boundaries of mining claims in an effort to prevent injury to wildlife. However, about half of the protective caps that have been installed on markers since then have become displaced, thereby re-establishing the hazard from the pipes. .... a subsequent law ruled that stakes without caps or crimps would no longer be recognized as claim boundary markers." There were 3.4 million mining claims in the 12 western states as of 2010, with a minimum of 4 stakes per claim, but there is no count of how many are PVC pipes, and of those, how many are open at the top. 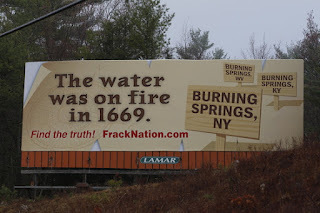 Crusading reporter Ann McElhinney is taking on the movie "Gasland" with a documentary movie of her own called "Fracknation", arguing that widely viewed documentary misrepresents the real situation of hydraulic fracturing ("fracking") of shales in the eastern US for natural gas. Ann followed me yesterday on the Energy Minerals Division luncheon program at the American Association of Petroleum Geologists Annual Meeting in Long Beach, California. (I spoke about the 'big data' revolution and what it means for the geosciences). Her energy and enthusiasm fired up the room. "Gasland" has gained worldwide notoriety for showing water from kitchen faucets being lit on fire purportedly from contamination due to fracking. It's created intense concerns about shale gas and fracking and prompted some nations to ban fracking outright. Ann and her production team have been interviewing hundreds of residents in the towns in the film and researching the groundwater histories, to show that natural gas in local wells is a long standing problem preceding gas drilling and fracking by decades or even centuries. Thus explaining why numerous towns have names like "Burning Springs." Ann and her fellow producers pitched their idea on the KickStart website and quickly raised all the funds they need to make Fracknation. 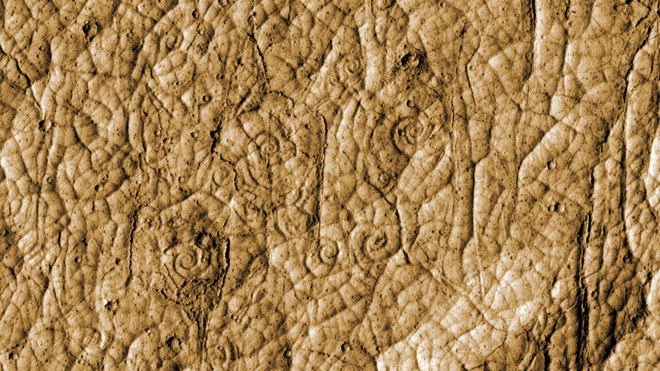 ASU is reporting that "High-resolution photos (taken by a UA camera) of lava flows on Mars reveal coiling spiral patterns that resemble snail or nautilus shells. 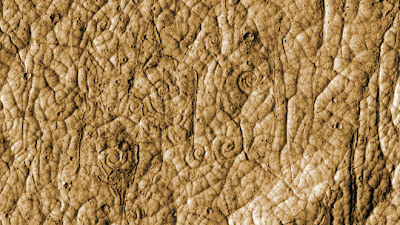 Such patterns have been found in a few locations on Earth, but never before on Mars. The discovery, made by Arizona State University graduate student Andrew Ryan, is announced in a paper published April 27, 2012, in the scientific journal Science. The new result came out of research into possible interactions of lava flows and floods of water in the Elysium volcanic province of Mars." The ASU announcement said that on Earth, lava coils can be found on the Big Island of Hawaii, mainly on the surface of ropey pahoehoe lava flows. They have also been seen in submarine lava flows near the Galapagos Rift on the Pacific Ocean floor. Ryan explained, "The coils form on flows where there's a shear stress – where flows move past each other at different speeds or in different directions. Pieces of rubbery and plastic lava crust can either be peeled away and physically coiled up – or wrinkles in the lava's thin crust can be twisted around." 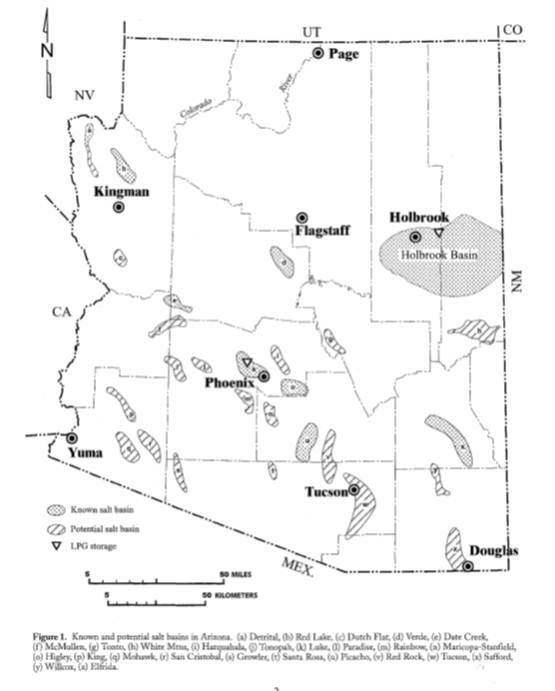 The USGS released a compilation 1:250,000-scale geologic map and report covering the Detrital, Hualapai, and Sacramento valleys in northwest Arizona, with the purpose of "improving understanding of the geology and geohydrology of the basins beneath those valleys." The map was compiled from existing geologic mapping, augmented by digital photogeologic reconnaissance mapping. The most recent geologic map for the area, and the only digital one, is the 1:1,000,000-scale Geologic Map of Arizona by AZGS. 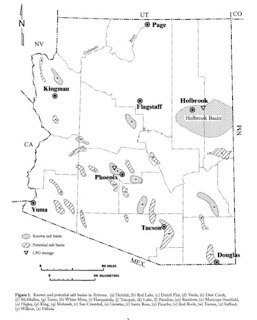 Ref: Beard, L. Sue, Kennedy, Jeffrey, Truini, Margot, and Felger, Tracey, 2011, Geologic map of Detrital, Hualapai, and Sacramento Valleys and surrounding areas, northwest Arizona: U.S. Geological Survey Open-File Report 2011–1225, pamphlet 43 p., 1 map sheet, scale 1:250,000, available at http://pubs.usgs.gov/of/2011/1225/. The Arizona Legislature is telling the federal government that we want to store nuclear waste (spent fuel from power plants) in Arizona according to a story in the Arizona Republic. The legislative resolution passed yesterday is non-binding but the US is looking for alternatives since the Obama Administration pulled the plug on the Yucca Mountain waste repository being built in southern Nevada. AZGS geologist Jon Spencer gave an overview of Arizona's salt resources to a community forum last night, organized by Sen. Melvin. AZGS was only providing scientific information about the location, size, and characteristics of salt bodies. We have not taken a position on how effective or practical salt storage would be, nor are we carrying out any studies of using these salt bodies for possible storage sites. The company will drill new wells in 2012 and do more extensive testing of those than the previous operator did, to better see if they can improve performance and establish commercial production rates. Construction would begin in 2013 and the field would go into production in 2015. If successful, Kinder Morgan foresees eventually drilling 250 wells in the field and building a 400 mile long, 20” diameter pipeline to the town of Denver City, on the Texas-New Mexico border to carry 450 million cubic feet per day (MMCFD) of carbon dioxide. If the field production turns out to be less, the company would look at a 10” diameter to the northeast to connect with the CO2 pipeline from McElmo Dome. 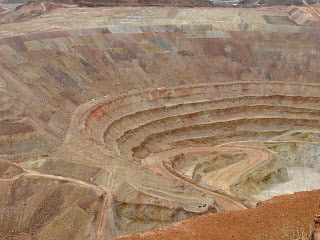 There's an intriguing story being reported out of China, that the Chinese Minister of Land and Resources Xu Shaoshi, said in an exclusive interview that 'China is running short of 25 kinds of mineral resources, including 11 that are crucial to the country's economy.' The frustrating part is that there are only vague references to what these minerals are. China Daily USA reports that "more than half of the country's petroleum, iron ore, refined aluminum, refined copper and leopoldite were imported," according to the minister, and adding that "China will have to sharply increase imports of minerals in short supply to meet demand over the next 10 to 20 years." I'd like to know which minerals the Minister includes in his list of 45 and which are the most critical. China's demands for energy and minerals have huge impacts on global resources and prices. We have seen an increase in Chinese investors in the past year or so, looking for mineral resources in Arizona, to both develop or just purchase the mined resource. The latest issue of EARTH magazine from AGI has an article on "Managing the seismic risk posed by wastewater disposal," by Stanford geophysicist Mark Zoback, that debunks some of the confusion over hydraulic fracturing ("fracking") and earthquakes. He concludes that "water injection associated with hydraulic fracturing is not responsible for the triggered seismicity in question. The reason for this is that pressurization during hydraulic fracturing affects only limited volumes of rock (typically several hundred meters in extent) and pressurization typically lasts only a few hours." Instead, the earthquakes that are generating so much attention result when the "wastewater that flows back out of the wells is disposed of at dedicated injection wells." Mark cautions that "we have to be prepared to reduce injection rates, or even abandon wells if triggered seismicity cannot be stopped by limiting injection rates." In summary, he says "Overall, it is important for the public to recognize that the risks posed by injection of wastewater are extremely low. In addition, the risks can be minimized further through proper study and planning prior to injection, careful monitoring in areas where there is a possibility that seismicity might be triggered, and operators and regulators taking a proactive response if triggered seismicity were to occur." For background, there is no hydraulic fracturing going on in Arizona, and no reports of induced seismicity from wastewater disposal. Arizona rivers have the potential to host 4 hydroelectric power plants of more than 1 MW capacity each at existing dams, plus one on the Colorado River, according to a study by Oak Ridge National Laboratory for the US Dept. of Energy. Overall, the report concludes that nationwide "Hydropower generation could increase by 12 GW, or about 15% of current capacity, without building one dam on the nation’s waterways." Boualem Hadjerioua, Yaxing Wei and Shih-Chieh Kao, Oak Ridge National Laboratory, April 2012, 44p. Is Freeport a takeover target?